When I found out I was having a boy, I was a wee bit sad that I wouldn’t get to put big Southern bows in his hair or dress him in those little lacey fold-over socks with white keds (perhaps one day I’ll post a photo of ME when I was a child…. ha. As they say “the bigger the bow, the better the girl”). But just because he’s a boy, doesn’t mean I can’t monogram the heck out of Brady’s clothes or dress him in seersucker seven days a week, RIGHT? 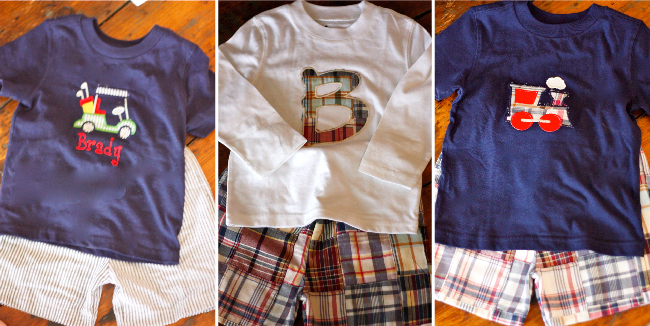 I love a good monogram – an if you ask me, every little boy needs a little blue seersucker outfit. 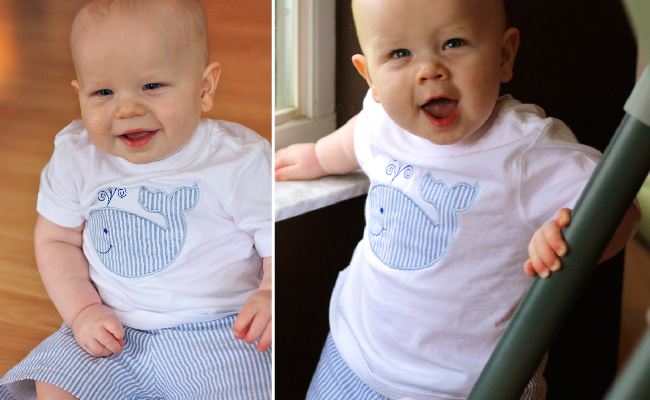 So in my quest to accomplish two things 1) find the most adorable custom clothes for Brady without breaking the bank and 2) support a small, creative business like mine… I stumbled upon Mommy’s Memories in my hometown of Pensacola, Florida. One of my friends’ sister’s little boys (you got that?) 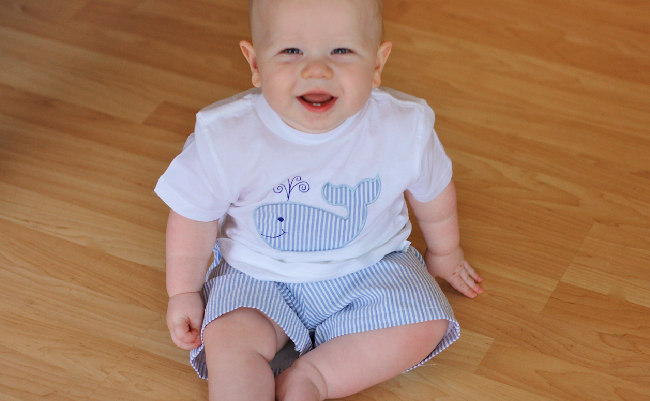 is quite possibly the cutest, best-dressed little boy I know. His name is Campbell and I’m not sure I’ve seen one photo of him without a custom made little outfit. CutiePIE. They are ADORABLE. I am the worst clothing-photographer ever apparently (do I even own an iron?? 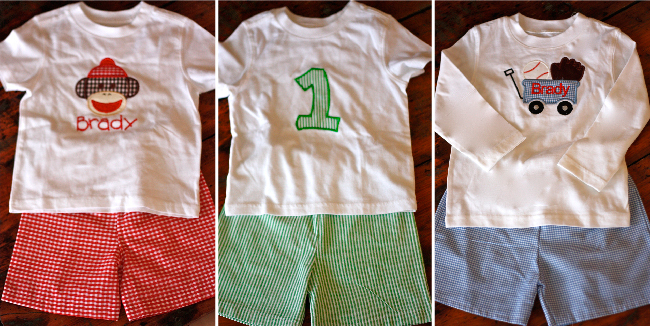 ), but these photos are of some of the outfits they made for Brady. The two not pictured are the two he’s wearing. 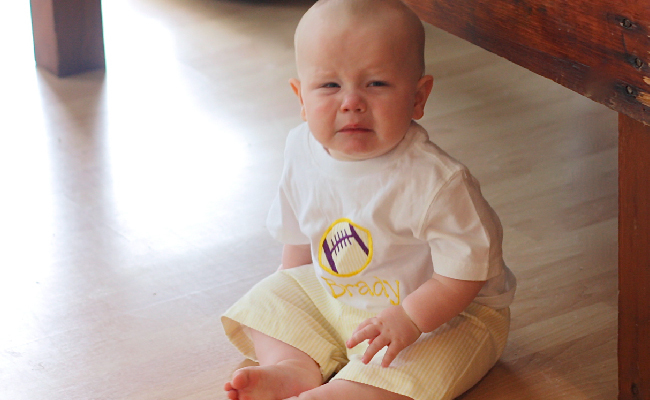 Apparently he was VERY upset over LSU’s National Championship loss and did NOT want to wear the yellow seersucker/football outfit OR have his photo taken in it, but the whale outfit was a success. I so love stumbling on small businesses that do a really, really amazing job. You can guarantee Brady’s closet will be filling with more clothes from these ladies. I’m starting a special little project collecting favorite small businesses (especially Etsy shops) that sell personalized items. Think babies, children + women in general. I’d love to know your favorites!